Camping is one of my favorite things to do…even in the winter with snow in the forecast. Food is always a highlight and I love trying different ways to switch up the normal camping cuisine so I am trying Taste of Home’s Summer Sausage Hobo Packets today. I am fortunate to have one of those husbands who loves to take care of everybody and that is even more so when we are going on any kind of trip. Jeff likes to handle the groceries and take care of all the cooking so it was a bit of a challenge for me to convince him to let me take the role of chef one night during our trip to the hunt camp, HIS domain! As I began my preparation of cutting up the veggies for the packets, I found out my “handy helper aka hubby” had forgotten a couple of items..the potatoes and the summer squash. No big deal since as most home cooks know improvising is a common step in good food! i decided to omit the chicken, no particular reason…just didn’t think it was really needed. I substituted the green bell pepper for yellow since I am not fond of the taste of green bell peppers. That turned out to be a good idea since that replaced the yellow from the missing squash (yes, even when camping, I do still like the food to look pretty on the plate)! Directions Combine the first 8 ingredients in a large bowl. 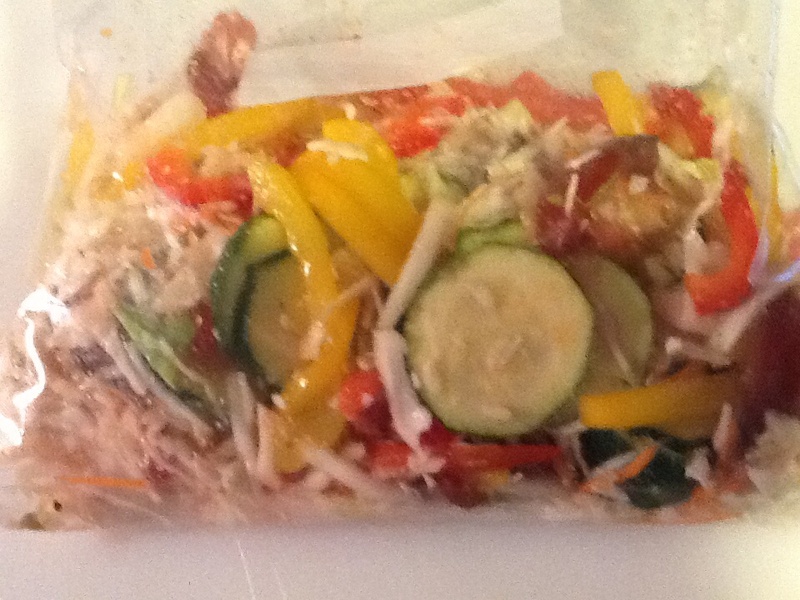 (Since it is just the two of us, I obviously used less veggies and put it in a gallon size Ziplock bag). Add the Italian seasoning to coat. (I let this marinate for 30 minutes in the refrigerator). 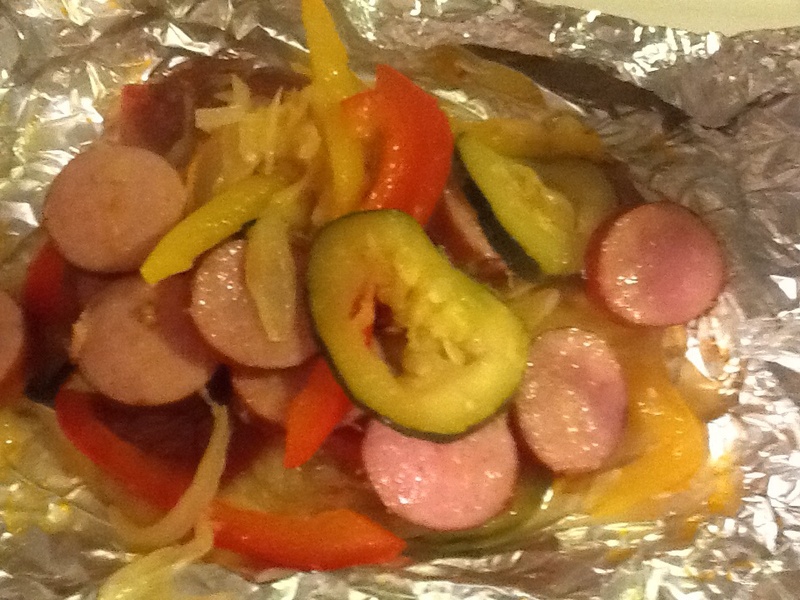 Divide the vegetable mixture onto 8 square foil packets, placing the sausage on top, (I just made two packets but had I been home, I would have made more for leftovers). Top each with a butter cube and seal tightly. 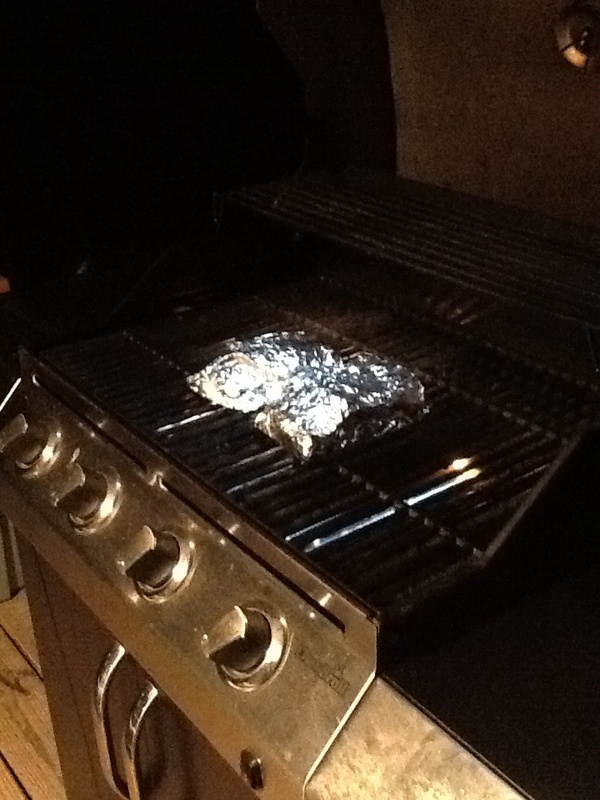 Grill, covered, over medium heat (20-25 minutes) until vegetables are tender, and if using chicken, it is cooked through. 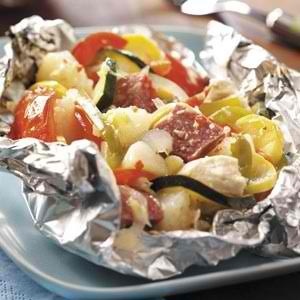 Carefully, pen foil packets to release steam and this easy to clean up meal is ready to serve!